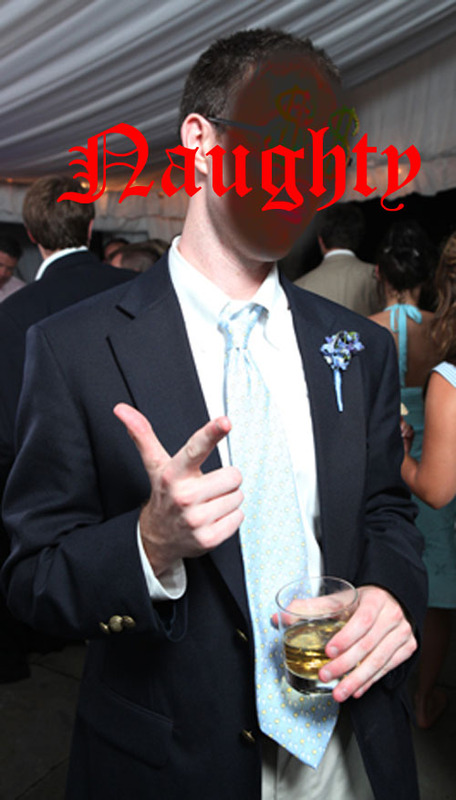 Everyone knows who the Naughty Groomsman (TNG) is. He is the crazy fraternity brother, the best friend since grade school, the cousin from the ‘crazy side of the family’ or the ridiculous co-worker who is always stirring things up. But to no avail and usually against the brides wishes and the groom’s better judgment, he has just secured a place in the wedding party. TNG has a signature dance move. The most popular move is ‘The Worm’ but other infamous moves might include jump splits, high kicks or ‘The Thriller’ dance in its entirety. TNG is a bold and fearless dancer and will never shy away from a dance off or a chance to display his ‘skills’ in the center of a crowd. TNG is fun but fearless and will never shy away from a dare. This also serves as a large part of his appeal. Chicks love TNG. The bride will warn the bridesmaids as early as her engagement party that there are a lot of nice boys in the wedding party but to steer clear of TNG. Nonetheless – someone will fall for TNG’s charm. A woman who can handle this type of man in celebratory circumstances might actually be the perfect match for him in the long run. Disaster #1: TNG ‘kidnaps’ the groom and gets him blasted the night before the wedding and might cause both him and the groom to be MIA just hours before the wedding. The Fix: Threaten the TNG with blackmail or in extreme cases physical harm. This will be difficult as TNG is not easily threatened but a little creativity can go a long way with this one. A good idea would be to pull him aside and sweetly let him know that your groom showed you a picture of him from college/the bachelor party/middle school that no one would want to see and that in fact you only saw it by accident and were sworn to secrecy but that you will produce said picture if Groom is not where he needs to be during the wedding weekend. There is no picture and this is an empty threat so you must be firm. TNG will try to call your bluff and say that whatever you ‘may’ have will not embarrass them. This is when you simply walk away. Even though they may act like they aren’t flustered – they are. Disaster #3: TNG has control of a microphone. 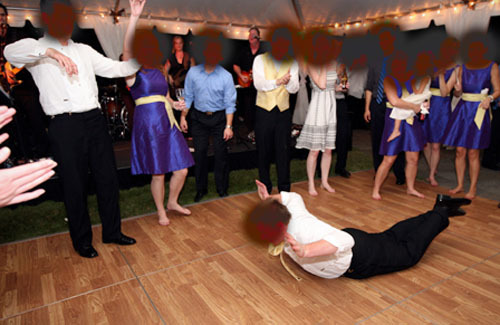 The Fix: Whether this happens at the rehearsal dinner or the wedding this is can turn into every brides biggest nightmare. If a toast that will be more like a ‘roast’ is a fear then have a wedding party member handy to remove the mic from TNG’s hand if the comments ‘cross the line’ during toast time. Even though he may want to tell the story, your grandmother doesn’t need to know that your groom puked all over himself during the first home football game freshman year. Warn your band or DJ that should TNG obtain a microphone they should immediately turn off the mic and distract him with a prop – preferably a tamborine and then send him back into the crowd. Disaster #4: TNG breaks/loses something. The Fix: Don’t give TNG any real responsibility. He doesn’t want it and it will just cause stress. He might even taunt you about “hoping not to forget to pick up the tuxes.” Make sure your hotel rooms don’t have mini bars but do have hotel security. 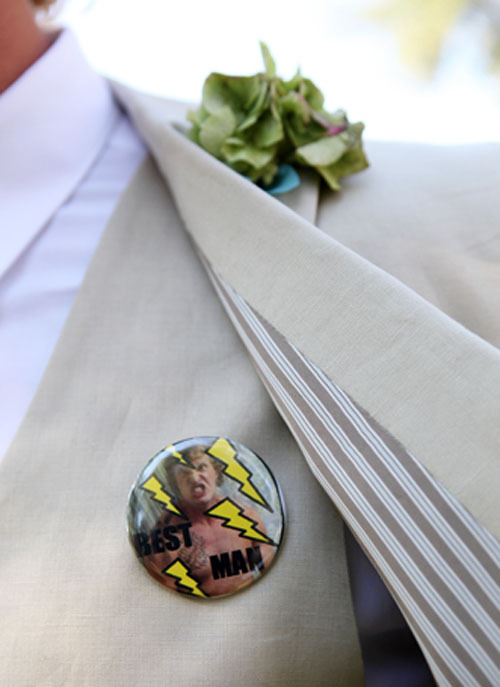 If given the opportunity put TNG in a room with a tamer groomsmen – preferably someone with a background in law enforcement or karate who could physically disable TNG if needed. Don’t let TNG be alone near red wine, large bodies of water, the gift table, an open flame or the cake. Disaster #5: TNG does not have a good time. The Fix: The biggest issue with TNG is that he is fun. He is the party. But he is dangerous in his inability to slow down the extreme party train once it start chuggin’ along. You want TNG to have fun – you just don’t want it to happen at the expense of you or other wedding members enjoyment. Other guests will follow TNG’s lead so you want him to have a blast. This is when we reveal our biggest secret to containing TNG. Invite his parents. They already know how wild he is but there are some things that a man will just not do when his mother is in the same room – no matter how much they have had to drink. This way TNG will keep himself in check but still be able to enjoy the party. What are your experiences with TNG? Do you love him? Hate him? Love to hate him? We would love to hear about your personal experiences! Disclaimer: These pictures were modified to protect the innocent. In no way whatsover have the people within these pictures committed TNG offenses. All wedding party members are innocent until caught by the photographer looking guilty. Image Source: Jennifer Beerden Photography (except one) who is in no way associated with the opinions or thoughts expressed in the above post.